This creative wunderkind, an Elle Décor Designer A-List honoree, has migrated from youthful career indecision to industry luminary status in relatively short time. As he adroitly grows his design “empire”, he relies upon the sound business strategies that he has acquired as an accomplished marketer, all the while maintaining the creativity, enthusiasm and authority that one expects from a design legend-in-the-making. As a result, this son of modest, middle-class beginnings has built the Jay Jeffers brand to prominence, popularity and profitability, and shows no sign of letting up as he plots a pathway to additional design fame and business fortune. I was born in Dallas and lived in Plano, Texas, a town of 100,000 people at the time. My mother was a teacher at the time; my father was in the insurance industry. I grew up a gay kid. Initially, I wanted to be the normal guy who played football and married the home-coming queen. That was probably the biggest struggle in my life as a teen — trying to be who I was. But I didn’t want to be who I was. Amazingly, given my very conservative home environment, both of my parents were incredibly accepting. I initially enrolled at the University of Texas for an architectural engineering degree but I realized I didn’ want to be an engineer. I took a marketing class and fell in love with all the creative aspects of advertising, marketing and promotion. I switched disciplines, and when I graduated with a degree in International Business and Marketing, I took an entry-level job with a small advertising agency in Austin at $16,000 a year. I was the receptionist, office manager and chief bottle washer. I fell in love with San Francisco the moment I first saw it. I was on a Super Shuttle from the airport and I remember that a fellow passenger exited the shuttle and went into a Victorian apartment on a hill. I remember thinking, “Oh my gosh, that’s a real person who actually lives and works there.” A light bulb went on in my head: “People do function in this city. It’s not just a fantasy place that you go to visit– and I can do the same thing.” I packed my car, said goodbye to my friends, gave two-weeks’ notice at my job, and drove to San Francisco. Initially, I took a day job at Zuni Café and a night job at Structure, a men’s clothing store. I also worked a part-time job at a small advertising agency before being hired at the Gap, where I worked in Advertising for the Gap, Gap Kids and Old Navy brands. But I was craving a greater outlet for creative expression, and took an evening course at Berkeley Extension on the “Introduction to Interior Design”. Loved every minute of it! I balanced evening and week-end classes and studies with a reduced, part-time role at the Gap, gopher work for designer Richard Witzel and a job at Susan Chastain’s drapery and bedding showroom working on installations for Tucker & Marks, The Wiseman Group and Gary Hutton. 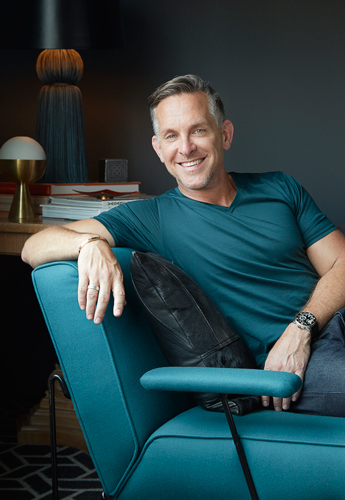 The Jay Jeffers business incorporates interior design, interior architecture, and furniture design which is marketed through Arteriors, the company that licenses my name and my designs. Our first Arteriors collection in 2015 emphasized entertaining—trays, ice buckets, light fixtures, small cocktail tables, etc. The new 2017 collection expanded into upholstered pieces, more lighting and case goods. We also consult on art, antiques, acquisitions and decorations for private clients through our design firm, and feature antiques, vintage pieces, as well as emerging companies and designers in fields such as lighting and furniture, through our retail store. It’s only in recent years that I’ve considered myself as successful, but I still regard myself as an aspiring novice when compared to the likes of Paul Wiseman, Suzanne Tucker and Gary Hutton, who has been an idol of mine forever. Having said that, I’m definitely confident in who I am and what I do as a designer. We just finished a project at The St. Regis, a luxury high-rise, two apartments that the client bought and joined together. We gutted it. Took it down to the studs. My client has a Bohemian spirit, so she likes color and bright things. She wants her friends to be comfortable, but yet it’s so incredibly chic. She likes everything to be perfect and in its place, so it’s lots of paneled walls, gorgeous views, and open windows. The entire floor in the library is one big cushion. We call it the, “Cuddle Puddle Room” where everybody can hang out, smoke a hookah, and listen to music–just feel comfortable. In the media room, we designed a custom built-in sectional where the two ottomans basically create a huge bed. She’s a gamer, and if her friends are all playing video games in the media room, you can pull the two ottomans out and it becomes a beautiful place for seating a gaming party.